Disclaimer: I was provided a set of David C Cook Family Devotions for reviewing and hosting a giveaway. All opinions, however, are my own and have not been influenced by the author/publisher in any way. Few tasks are of greater importance than teaching your children about God. With all the things vying for our kids’ hearts and minds, it’s vital that we make this a priority when they’re young. In order for their faith to grow strong roots, we must be consistent in opening up the Word of God with them and giving them practical applications of Scripture. A meaningful devotional, based on biblical truth, can also help build our kids’ faith. While they shouldn’t take the place of Scripture, devotions can be a great addition to daily Bible reading. 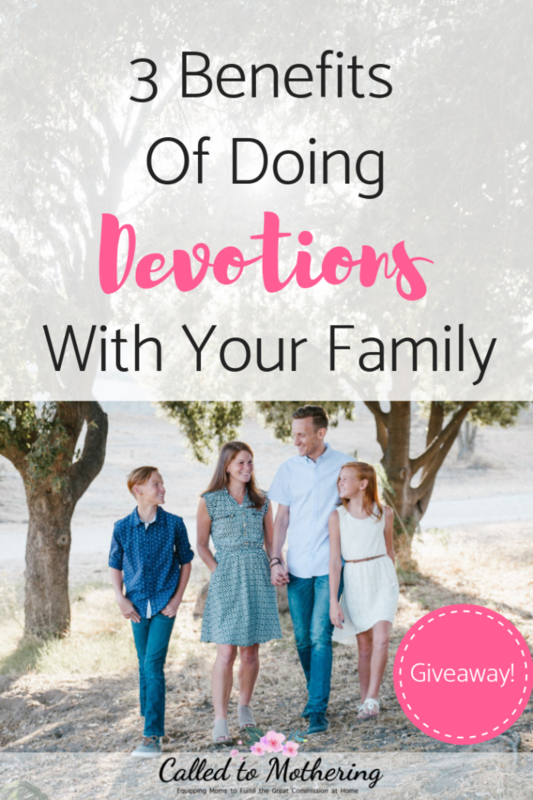 Gathering your family together for devotions in our busy culture can be difficult, but it reaps so many benefits. You have the great privilege of leading your children God’s way! There’s something about shutting out all the distractions and coming together around the dinner table, or on the living room couch. It builds unforgettable bonds. Great discussions and memories take place when we intentionally set aside time to focus on what’s most important in life. Reading and talking through God’s Word helps you not only grow closer to God, but to one another. As each person shares what they got out of a particular verse, it gives the rest of your family insight into one another’s thoughts on spiritual matters. This treasured time centered on Scripture will be a special memory in the minds of your kids for years to come! Building your family on a solid foundation of biblical truth is so important in a day and age where everything is subjective. Our kids need to be both biblically literate and able to articulate their beliefs. Devotions often underscore key theological concepts, leading to a greater understanding of truth. Your children learn doctrine in a simple and engaging way through stories and illustrations that relate to what they face in everyday life. And those doctrines are the pillars their faith will rest on. As you learn about God’s character, you come to know and love Him, which leads to trusting Him. Devotionals can give you an opportunity to explore verses that help you think more deeply about God’s nature. Their questions and commentary often provide a springboard for you to discuss your own faith with your children. They also provide a starting point for your kids to begin talking about what they actually believe, rather than just what they’ve been told. David C Cook Family Devotions are a great way to form familial bonds, build a strong foundation and grow your whole family’s faith! Though brief, they pack a lot of biblical truth into each day’s reading and are an excellent way to introduce your kids to each person of the Trinity. Simple, yet meaningful, these devotions provide life-changing truth for every day of the year. Each devotion opens with a Bible verse, followed by a poetry-style passage to read aloud to your children. There is a specific parent section, that includes comments with depth for you, and a section for your kids with a thought-provoking topic or question that provides a launching point for life application. Beautiful illustrations combined with a poetic style engages your child with the opening Bible verse in a way that lights their imagination and touches their hearts. At the end is a suggested prayer your child could say to God, Jesus, or the Holy Spirit, which ensures your family remembers the most important thing- time spent talking with God. What I loved about these devotions was that they provided a growing experience for us as parents right alongside of our children. 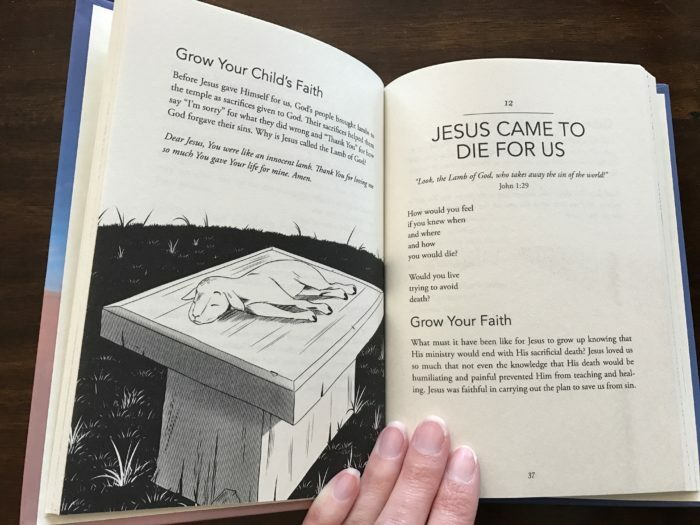 They feature simplified doctrine with easy-to-understand language so kids will be engaged and able to follow along, but their theological depth strengthens adults’ faith as well! 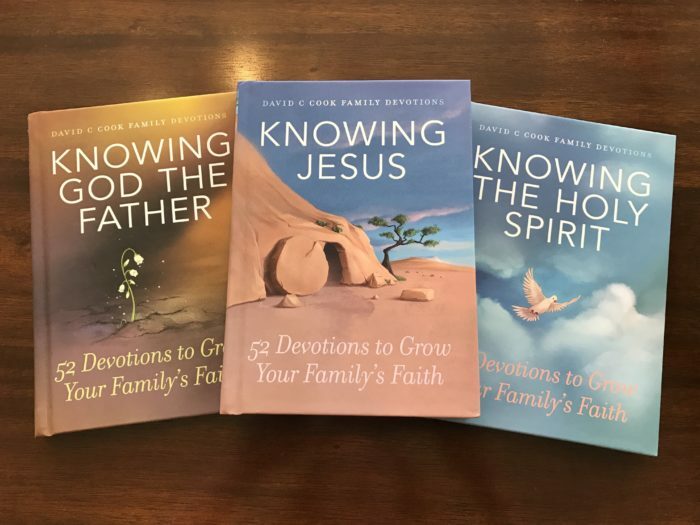 Enter for a chance to win your own copy of David C Cook Family Devotions from David C Cook Publishers and FrontGate Media. 4 winners will be selected on November 25, 2018 and notified by email. Click the banner above to enter the giveaway!